"But why shouldn't you put your dog on Craigs List?" Many of you know how much I love Craigs List. I have had extraordinary luck with it, finding Clara to care for Beatrix, the apartments in Spain where we stayed for our honeymoon, our handyman, and yes, our previous keeshond Geronimo. But I have been extraordinarily lucky. So, about a month ago, on a Wednesday, T called to ask if I could help; could I travel to a breeder to pick up two Kees? Theresa, "They need out by Saturday or they probably won't make it out at all." Me, "OK. . . Where am I going?" Theresa, "That's the thing; this is the same breeder that had Ziva." Theresa gave me the contact details and I scrambled to arrange the trip across 2 1/2 states. Some of you know the rest. You cheered and supported me as I drove. You all lifted me up as I secured the dogs and shook hands with the devil. I will never forget her; that woman's face is imprinted in my brain. Would I go back there? Absolutely - I'd grit my teeth, try not to vomit on her shoes, grab the dogs and head back for home. What other alternative is there? Marta and Frieda both tested positive for stage 4 heartworm. Marta had mammary tumors, ovarian cysts and a number of uterine tumors. All were removed. 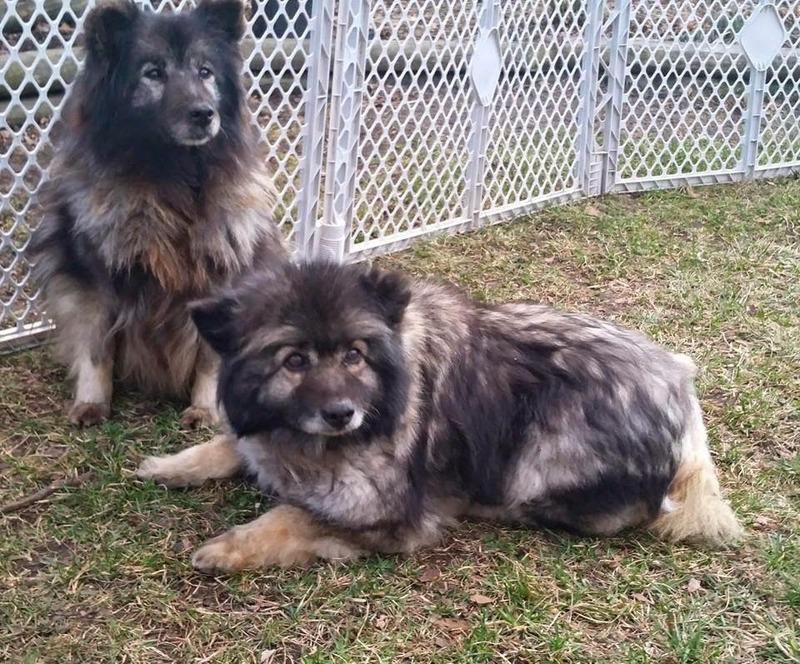 Both girls were started on medications in preparation for heartworm treatment. Frieda's heartworm load was severe and she was blind. Eight days after rescue, her blood pressure dropped, she collapsed and we had to let her go. Radiographs revealed a smaller than anticipated heart worm load for Marta, but also showed two cancerous tumors in her chest. She is on a drug cocktail to do what we can to prevent the heartworm from proliferating, while monitoring the tumors. We hope and pray for her. Join us if you will. The oldest chip went back to a woman in Kansas who shared that she and her husband had three kees that she sold about seven years ago. "They were Jim's pride and joy," but when her husband developed sudden severe Alzheimers - she was unable to care for him and the dogs. She cried when I told her of Marta's condition, saying, "Jim would be heartbroken. I'm glad he isn't here to know what happened to his baby." No, I didn't ask much more other than to learn the dogs were young and she thought Marta was about 18 months. The woman was crying so hard understanding her was difficult. She said all three went to the same woman, but after so many years, no longer had the records. The second chip wasn't registered properly either, but through the distributor (a company that caters to commercial breeders) I learned that this chip was sold as part of a "lot" about seven years ago. Yes, Marta went from a home to a breeder. Likely she stayed there until a couple years ago when she was sold/traded to the woman that released her to me. So, the mystery of three chips is solved, sort of. I guess, given the level of stress the original owner was under, she did what she had to do. Rescue groups were not so easily found even 7-8 years ago and I doubt the owner even knew they existed. I can’t even imagine how hard it would have been for Marta’s original owner to give her up, and to learn later what horrible things had happened to her baby dog. And we all hear the (unfortunately true) stories about animals that are acquired on Craigs List and go on to be abused, or used as bait, or other terrible things. Look, I know things change, and that you can’t always keep an animal that you had the best of intentions for. But if that happens to you, let me know, and I will help you try to find an organization to help. Craigs List is a great and wonderful resource — for all manner of things including the ways I have used it. But, I am coming to see, not so much for pets.